We use whole-body vibration therapy, also known as power plate therapy, as an effective way to enhance patient recovery. 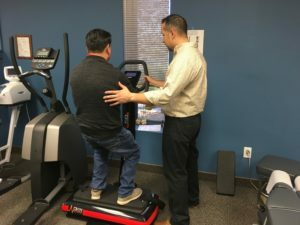 Whole-body vibration therapy is a form of therapeutic exercise that uses a gently vibrating platform to build strength, improve posture, and enhance coordination. Once our patients begin to feel better with our treatments, we use whole body vibration therapy as a strengthening and conditioning. While on the platform, patients perform simple yet effective exercises that target specific muscles groups needed in their recovery. Vibrational therapy has been shown in clinical research to greatly enhance posture and coordination in patients of all ages and levels of physical fitness. It has been shown to improve strength, while reducing muscle soreness. Vibrational therapy is not only helpful for pain and recovery but also a form of exercise for our healthy patients. Several studies have shown vibrational therapy to be effective in the reduction in the appearance of cellulite and body fat. Used with our Nulean Weight Loss Program whole body vibrational therapy can help you lose weight and feel great! Along with chiropractic therapy, vibrational therapy is great tool to ensure that you not only feel great when you leave our office, but continue to feel great thereafter. Contact our office today by call (845) 634-8877 for a complimentary evaluation. You can read more about why people find our chiropractic treatments effective here.